In the post Civil War years Winchester, Colt and Smith & Wesson were all vying for market share in the booming firearms industry. The Civil War had ended but the Indian Wars were far from over as the Union pushed to expand its territory further west, with the intention of taking over the whole country from Atlantic Coast to Pacific Coast. Smith & Wesson had beaten the opposition to the post by patenting their method of boring through a revolver cylinder to accept metallic cartridges and so they were able to create their No. 3 revolver in 1869. 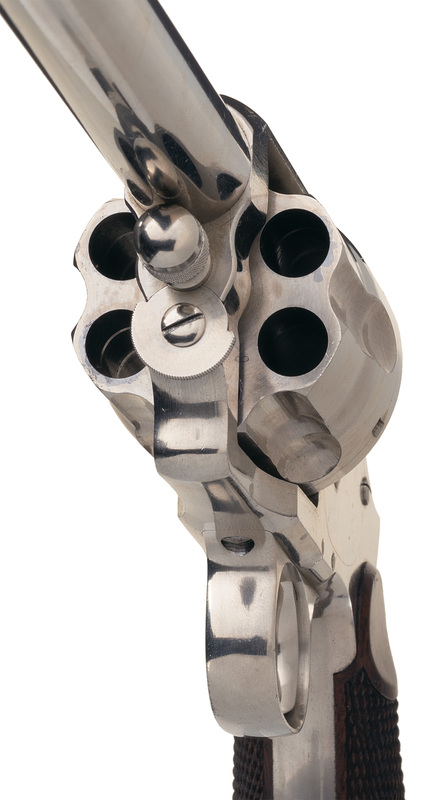 The Smith & Wesson Rollin-White patent did not expire until 1870 so both Colt and anyone else who wanted to get into the metallic cartridge revolver market was put at a disadvantage. Once the Rollin-White patent expired Colt lost no time in creating their Single Action Army in 1872 and getting it into production in 1873. But what of Winchester? Did they also try to enter the “revolver wars”? Yes they did, and they gave it their best shot. The overall shape of the Winchester Wetmore-Wells revolver shows an unmistakable heritage from the Smith & Wesson No. 3. This drawing is of the automatic ejector model. Note the absence of the ejector lever by comparison with the photograph below. Winchester did a bit of “head hunting” and were able to recruit two Smith & Wesson designers to come and join them, William W. Wetmore and Charles S. Wells. These two were tasked with creating a Winchester revolver. It is significant that the design work done by Colt to create their 1873 Single Action Army produced something that was clearly a completely different design, something that would prove to be to its advantage. By comparison the revolver that William Wetmore and Charles Wells created shows an immediate and obvious Smith & Wesson No. 3 heritage. The big and significant design difference being the use of a solid frame and fixed cylinder instead of the hinged break action of the Smith & Wesson No. 3. 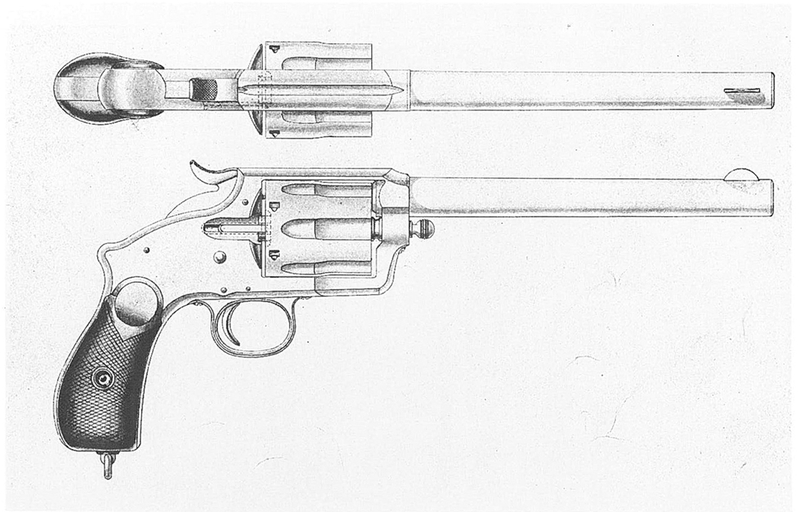 The Wetmore-Wells revolver had a solid frame and was made in both automatic ejector and manual ejector models. This is the manual ejector model as can be seen by the ejector lever to the rear of the cartridge loading port. In order to make the Winchester revolver marketable by comparison with the Smith & Wesson No. 3 and any other revolver that might appear Wetmore and Wells knew they needed to do some things differently and so they tried to create their revolver with features the Smith & Wesson did not have. 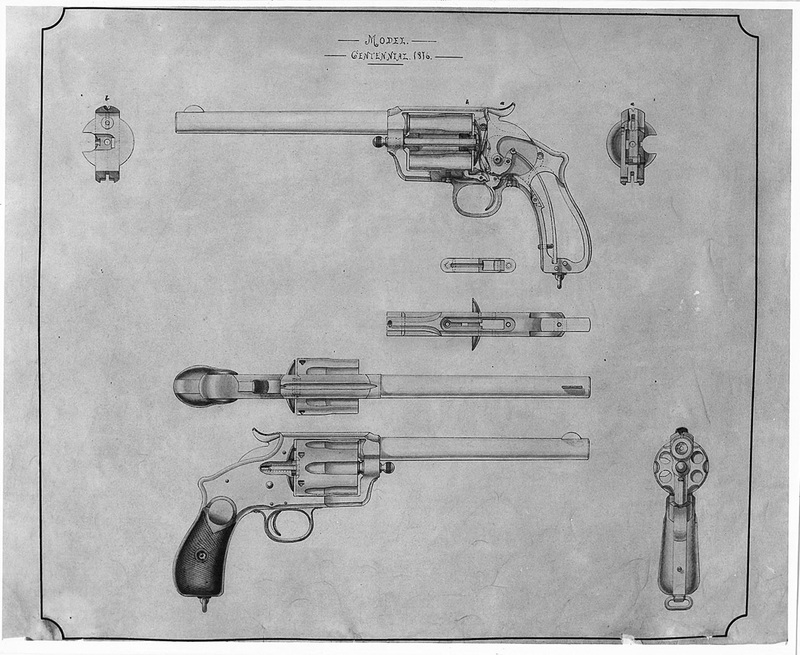 Wetmore and Wells decided to use a solid frame and a fixed cylinder on the notion that this would make the revolver stronger and that this would be a marketing advantage. However, if the frame is solid and the cylinder fixed then there needed to be something that would make the process of reloading easier. The answer was to create an automatic ejector to eject spent cases as the revolver was fired. Unfortunately this turned out to be a “nice try but no Cuban cigar” idea. Wetmore and Wells just couldn’t get it to work reliably. Revolvers are made to be used in life or death situations and in a life or death situation that the revolver works reliably is of paramount importance. The manual eject system was created when it proved impossible to make the automatic ejector work reliably. Wetmore and Wells next effort was to create a manual eject system using a lever behind the loading port. Like its automatic predecessor this also could not be made to work reliably. They then moved on to creating a solid frame revolver with a swing out cylinder system created by another Winchester engineer named Stephen W. Wood with some input by Hugo Borchardt. Although the swing out cylinder would come to rule the roost in the revolver world the Wetmore-Wood design was not going to be the revolver to establish it however. Winchester pushed ahead with the Wetmore-Wells and Wetmore-Wood revolvers and planned a big launch at the 1876 Centennial Exhibition in Philadelphia. However, whilst Smith & Wesson were awarded a contract to supply the Russian government with No. 3 revolvers chambered for the newly developed .44 Russian cartridge, and Colt won the US Army contract for supply of revolvers with their 1873 Single Action Army, success eluded Winchester. Charles Wells had even designed new cartridges for the revolver including the .40-50 that the nickel revolver in our photographs above is chambered for and a .38-50. So it was that the Winchester lever action rifle and the Colt Single Action Army revolver became known as the “guns that won the West”, whilst the Russian contract for No. 3 revolvers almost broke Smith & Wesson when the Russian government decided to order revolvers and then unexpectedly cancel and refuse payment. The Winchester revolver never made it past the prototype stage and so these prototypes are very rare indeed and come up for sale quite literally “once in a blue moon”. The Winchester Wetmore-Wells “Centennial 1876” revolver that is coming up for sale by Rock Island Auction is in near pristine condition. A Winchester Wetmore-Wells “Centennial 1876” manual ejector revolver is coming up for sale by Rock Island Auction Company over 9th, 10th and 11th September 2016 and this presents serious collectors with the opportunity to obtain an excellent example of this very rare revolver. You will find the Rock Island Auction sale page for this revolver if you click here. The Wetmore-Wells and Wetmore-Wood revolver designs are fascinating and vitally important designs that, although they did not achieve widespread acceptance nonetheless illustrate the creative design ideas that were forming in the early developmental stages of the cartridge revolver. That Winchester’s swing out cylinder design did not at that stage catch on is particularly interesting as it was an idea that would become the de rigueur design for revolvers by the end of the nineteenth century. Probably the definitive history of Winchester Arms is Herbert D. Houze’s book “Winchester Repeating Arms Company: Its History & Development from 1865 to 1981” and if you are looking to become fully informed about Winchester and their history it comes highly recommended. You can find this book at Amazon if you click here.